Completely remodeled and stunning! This rare end-unit with its bright and open floorplan features three bedrooms plus a main-level office. The kitchen has been totally reconfigured with custom cabinets, quartz counters, glass-tile backsplash, shiplap ceiling, high-end appliances, huge island, six-burner stove with custom hood and a stainless farmhouse sink. The kitchen opens to the dining area and living space with a custom fireplace, wine bar/fridge, and spacious seating area. This great entertaining area opens to the front balcony. Throughout the home runs rustic bleached oak flooring, exposed distressed beams, designer ceiling fan, custom light fixtures and many more designer touches. The second floor features an upper level laundry with folding station. 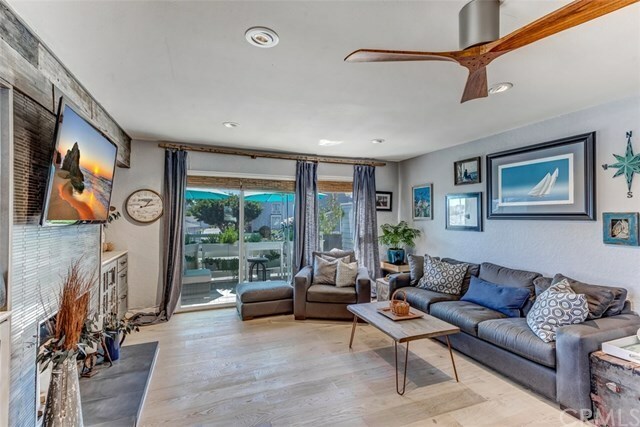 The spacious master suite complete with walk-in closet features vaulted ceiling, custom built-in desk area, private balcony with ocean views and a gorgeous remodeled master bath. The two secondary bedrooms have vaulted ceilings and share a large remodeled bath complete with subway tiles, custom lighting and one-of-a-kind features. The private rear yard and patio is a entertainer's delight with cozy seating and plenty of room for guests.The over-sized garage has direct access to the unit, a large separate storage area and an additional parking slot. The community is located within walking distance to downtown Dana Point and the Harbor.